Less Than Jake have announced some 2016 details and will be playing some smaller, intimate clubs to celebrate the 20 years of Losing Streak. They will play the album in its entirety one night and then play another awesome album, Hello Rockview another night in the same city. They will play Highline Ballroom on March 9th and then the next night will be at Gramercy Theatre in NYC. Tickets will certainly sell out so get them when they go on sale this Friday. 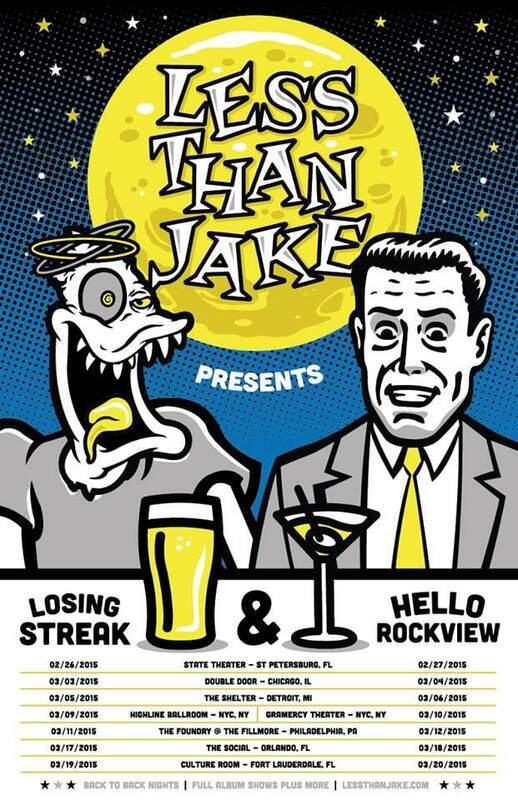 2 nights in each city: Night 1 will be Losing Streak, Night 2 will be Hello Rockview, both in their entirety. Both nights will include fan favorites from all other releases as well! Tickets will go on sale this Friday, grab em quick because these shows WILL sell out!! 03/20/2015: Culture Room – Fort Lauderdale, FL ++ ** Losing Streak in its entirety & more!! ++ Hello Rockview in its entirety & more!! Next: Rare Breed’s FREE Winter Sampler Available Now!